The old joke — CIO stands for “Career is Over” — is less funny than ever as cloud computing and the consumerization of information technology threatens to make the CIO role irrelevant. 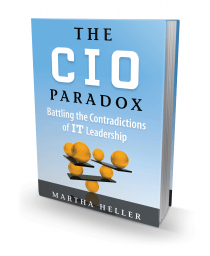 Martha Heller, who apparently has had an enormous amount of experience talking with CIOs and finding them jobs, offers advice on how CIOs can survive and thrive during the current computing paradigm shift. The book is written in an easy, chatty, informal style that belies its deep understanding of the pressures on CIOs to deliver more with less in world where the demand for IT services is ever increasing even as the supply is constrained. I think CIOs, and anyone interested in the future of IT in business, will be both entertained and informed by a book that’s hitting the right topic at the right time. This entry was posted in books and tagged books, CIO. Bookmark the permalink.